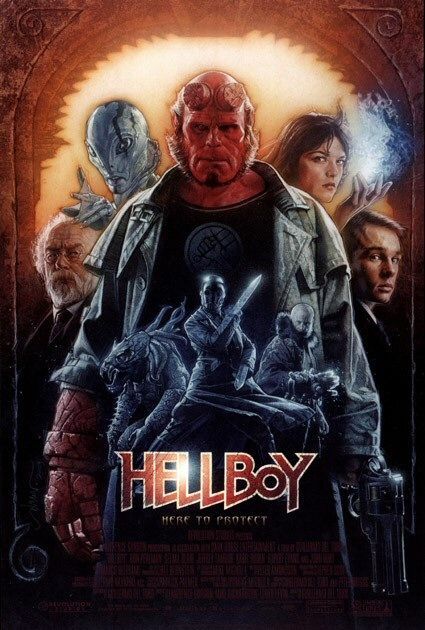 From visionary writer/director Guillermo del Toro (director of Blade II, The Devil's Backbone) comes Hellboy, a supernatural action adventure based on Mike Mignola's popular Dark Horse Comics series of the same name. Born in the flames of hell and brought to Earth as an infant to perpetrate evil, Hellboy (Ron Perlman) was rescued from sinister forces by the benevolent Dr. Broom (John Hurt), who raised him to be a hero. 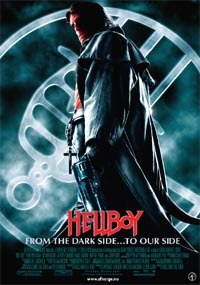 who seeks to reclaim Hellboy to the dark side and use his powers to destroy mankind. Weird comic books, like Hellboy, don't automatically translate well to the big screen. Writer-director Guillermo del Toro avoids all the worst pitfalls in making Hellboy the movie so much fun. He blends comic-book absurdity and over-the-top action with brash, brawny flair, and tops it off with a priceless sense of humor. And, man, without the jokes, this boat would sink fast, for all the dazzle of special effects and extreme makeup. The movie also owes its appeal to Ron Perlman, who plays the hell-born superhero at the center of a bizarre showdown with the forces of evil. Perlman is a veteran actor possessed of a killer voice and an unlikely romantic image dating back to his day as the hairy half of the 1987 TV series Beauty and the Beast. In Hellboy, he gives us a cigar-chomping, candy-munching hero with a sense of irony and a broken heart. When he's not swashbuckling his way around town killing monsters, he's mooning about Liz (Selma Blair), the girl he can't forget. The two grew up together in a secret guardian squad set up by Professor Bruttenholm (John Hurt) to "bump back" at supernatural forces. The plot, mined from Mike Mignola's original Dark Horse Comics tales, is too complex to summarize here. It's enough to know it is an unholy and mostly nonsensical concoction involving Nazis, museums, Rasputin, Moldavia, an eclipse, a resurrected dead guy, and the seven gods of chaos. Who, by the way, have blue blood. And live in outer space. OK, forget the plot. It's the characters who carry the movie, even the blustery, clueless boss played by Jeffrey Tambor and the wimpy young FBI agent (Rupert Evans) brought in to keep an eye on Red, as his friends call him. Between del Toro's florid imagination, and Perlman's wry, witty performance, Hellboy delivers a welcome addition to the superhero club.